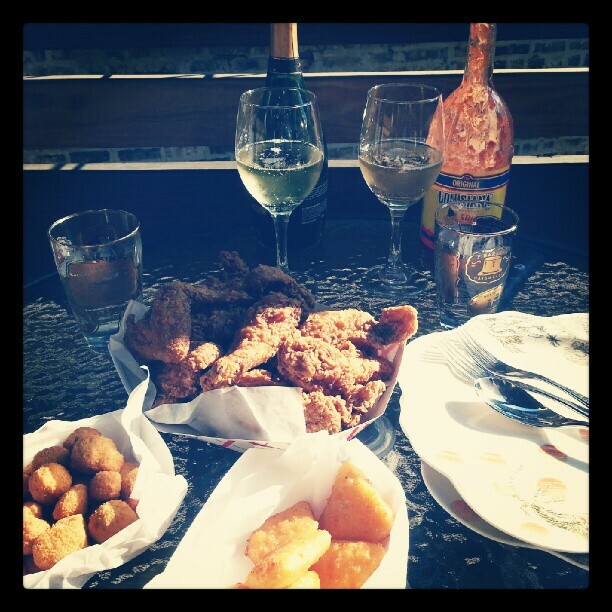 A co-worker recommended trying fried chicken and champagne, based on a wine-pairing expert’s tip, and how could I say no to pairing anything with fried chicken? So today, Adam and I picked up some fried chicken from Harold’s Chicken (the 30-minute wait was brutal) and popped open a bottle of champagne my landlord left in the fridge when I moved in. I gotta say, it worked quite well and it was the perfect Sunday dinner to enjoy outside.